Janssen Research & Development created an internal incubator program, known as the Janssen Incubator, which has been established to identify and nurture highly innovative ideas arising from our scientific community in areas of potentially disruptive, cutting-edge research, which may lead to novel platforms, products or technologies. Venture teams are created under an entrepreneurial operating model and strive to incubate and deliver high-value opportunities through internal and external networks and collaborations. These venture teams are focused on new spaces, or areas outside of the current Janssen disease focus areas, and are staffed and led by a group of our incredibly talented scientists. I am proud to lead the Janssen Incubator and to coach and support a highly motivated group of venture leaders. 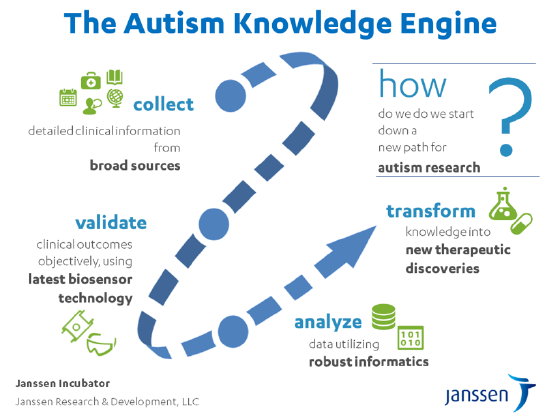 To date, the Janssen Incubator has invested in six ventures, including a team focused on the development of a system of tools and technologies that may ultimately address symptoms of autism and investigate new medicines to treat autism spectrum disorders (ASD), a collection of diseases for which therapeutic unmet needs remain high. Known as the Autism Knowledge Engine, this first-of-its-kind, digital, integrated system is designed to facilitate research and clinical trials for the development of novel medicines, which may ultimately help patients living with ASD. Collaborating with Microsoft, the venture brings together talent and expertise from a key information technology organization to develop a robust approach to therapeutic assessment and development. Microsoft HealthVault software provides a personalized electronic health record system, which allows us to create ASD-specific treatment and developmental milestones. The venture team takes an integrated collaborative approach, working with Autism Speaks, the world’s leading autism advocacy organization, to provide scientific guidance, and leverages the experience, capabilities and leadership of the Janssen R&D Neuroscience Therapeutic Area, as well as other scientific experts in the field of ASD and biosensor technology. 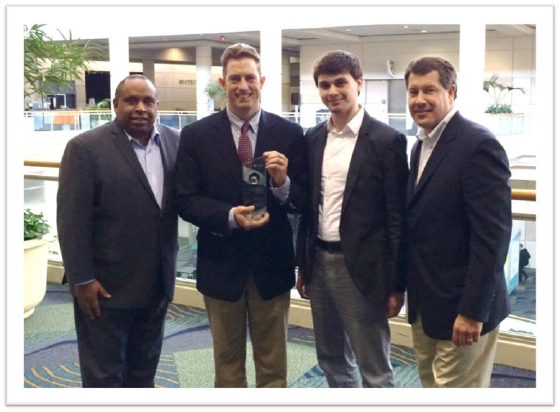 The venture team recently received the 2014 Microsoft Health Users Group (HUG) Award Innovation Award for Open Innovation. I couldn’t be more proud of the team and the efforts of all of the Janssen Incubator ventures, each of which is trailblazing in new areas – ASD; lupus; staphylococcal infections; chronic pain; a new technological approach in small molecule research; and a platform to develop therapeutics with reduced side effects. I look forward to bringing future updates from the Janssen Incubator and all of our ventures as we look to foster transformational medical innovation in new spaces. Rob Willenbucher, M.D. is Head of the Janssen Incubator, an internal, entrepreneurial group within Janssen Research & Development, which nurtures highly innovative ideas through venture teams in areas of potentially disruptive, cutting-edge research. Each venture team is focused on advancing novel platforms, products or technologies. Rob also serves as the Head of Janssen Cell Therapy, which includes a program in retinal (macular) degeneration. Rob earned his medical degree from the Columbia University College of Physicians and Surgeons and a master’s degree in business administration at The Wharton School of the University of Pennsylvania. He is a board certified internist and gastroenterologist and previously served as an Associate Professor of Medicine at the University of California, San Francisco.